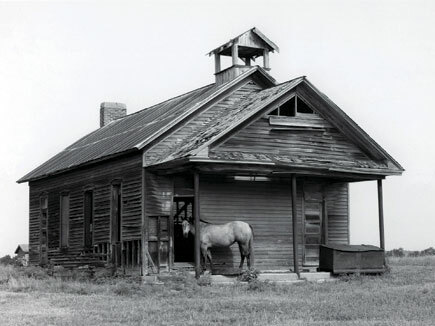 I had passed this long-abandoned, one-room prairie schoolhouse near Elk City, Kansas, hundreds of times over the years and each time I resolved to stop the next time to photograph it. Except for the chimney and tin roof, there had been no apparent effort to preserve the building, which is now on private property. Finally, on a hot, cloudless July morning, after 25 years of procrastination, I stopped to get my photo. I had taken a couple of shots when I noticed horses shuffling about inside. I whistled, nickered, clucked, and called, all in a futile effort to get one of them to come to the door. Eventually I gave up. I capped my lens and was about to move on when this gray mare came around the corner. She paused by the door while I fumbled to take the cap from the lens and reset the camera, then quietly disappeared into the cool, dark interior of the old school. Serendipity. Technical Info: Photo taken with a Canon EOS 20D and a Canon EF 28-135mm IS lens at 28mm. Post-processing was done in Adobe’s Photoshop CS2, using Duotone mode, Black and PANTONE Warm Gray 6 C.
One of the many reasons why photographers choose to take photos of old architectures and heritage buildings is because they want to preserve what is left of our past. I had taken a couple of shots when I noticed horses shuffling about inside.